Could the HTC One Max come carrying a fingerprint scanner? Robert Downey Jr. didn't herald its arrival (yet), but a new leak may give us a peak at something we've yet to hear about on the HTC One Max. Some pictures posted to Chinese website ePrice purportedly show the One Max towering over the HTC One Mini and HTC One. Average enough for a leak, but smack on the back of the Max is a previously unseen black square. Sitting below the camera, ePrice noted the blotch might be a fingerprint scanner. It carries inklings of the one found on the Motorola Atrix, though that device's scanner sat at the top at an angle, whereas this finger reader (if that's what it is) lies flat on the rear casing. As reported by Android Community, ePrice's source makes mention that the black box is a fingerprint scanner, but beyond taking this person's word for it, there's not a whole lot to stand on. 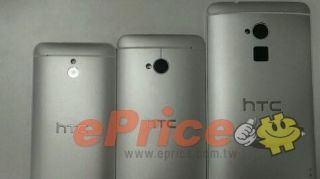 ePrice previously leaked photos of what it contended was the HTC One Max, though those images only captured the front of the phone. We've also seen an alleged blueprint design of the larger One, and that draw-up is devoid of anything reminiscent of a reader. As TechRadar U.S. Mobile Devices Editor Marc Flores put it, the "scanner" in today's leak is "big and ugly," and doesn't seem like something HTC would include, especially following the HTC One's generally loved design. However, while this photo could be nothing more than a fake, there are a few pieces of contextual evidence that give us pause in thinking HTC may just pack the Max with more than a rumored 5.9-inch display and 3300mAh battery. For one, Apple is heavily reported to include a fingerprint scanner in the upcoming iPhone 5S. HTC may have caught wind of the development (or vice versa) and decided the Max could do with one, too. Additionally, the scanner we're seeing here looks very much like the one belonging to the just-launched Pantech Vega LTE-A. In other words, it's not a total outlier, if indeed the real deal. With IFA around the corner, we could find the HTC One Max marching through the show's halls in just a few weeks time. Whether it treks to Berlin with a fingerprint scanner, we'll just have to wait and see. Think you're caught up with all there is to know about the iPhone 6?